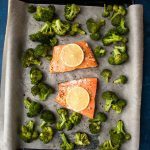 This sheet pan salmon with roasted broccoli is an easy and tasty weeknight meal your whole family will love! Ready in 20 minutes and filled with bright and fresh flavors! Guys! Meet my friend Ellie! She is the awesome blogger behind Hungry by Nature and makes awesome meals and sweet treats you can actually feel good about eating (and sharing with your family!) and focuses on using real foods to fuel your body. 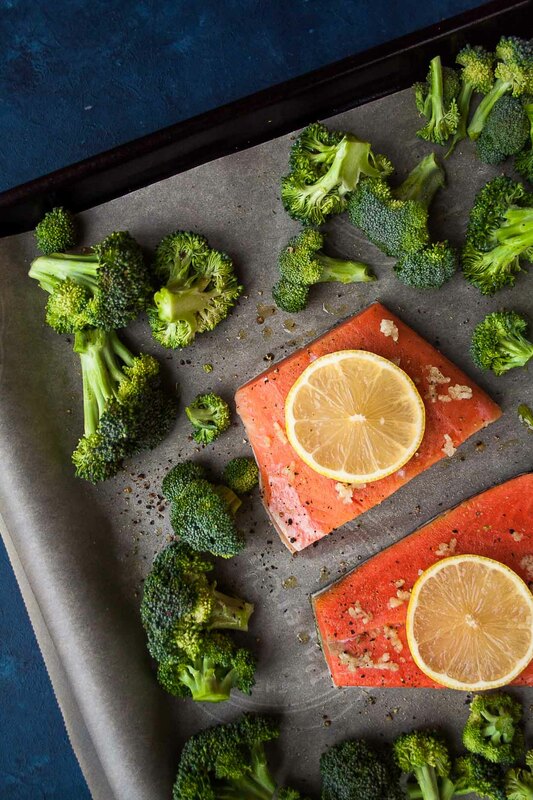 You have been asking for more seafood type recipes, so I am SO excited that Ellie is sharing an easy and delicious salmon sheet pan recipe I just know you are going to love! Please leave her some love by comments or sharing this post and then go check her out at Hungry by Nature! I’m Ellie, the girl behind Hungry by Nature, a gluten free and paleo food blog dedicated to inspiring others to live a healthy and balanced life, starting in the kitchen! My approach to food is simple – eat healthy, whole, natural foods and always leave room for dessert! 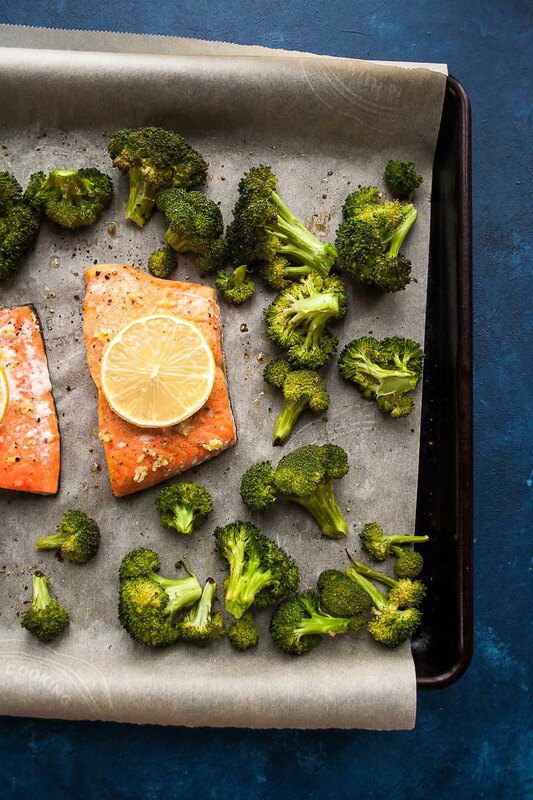 Say hello to your new best friend Sheet Pan Salmon with Roasted Broccoli. Quality of salmon does matter. Wild-caught is traditionally better than farmed or fresh-farmed; but it is also more expensive. I purchase both depending on my grocery budget for the week. Pick which option is best for you and your family. Wild-caught salmon is typically leaner and less fatty than farmed salmon. Again, if you like a fish that is a little more buttery in flavor, the farmed might be the better option for you. Tip for picking out your filets: do the poke test. Yep, the poke test. Press your finger into the thickest part of the filet. If it springs back, the fish is fresh. If not, don’t buy it! 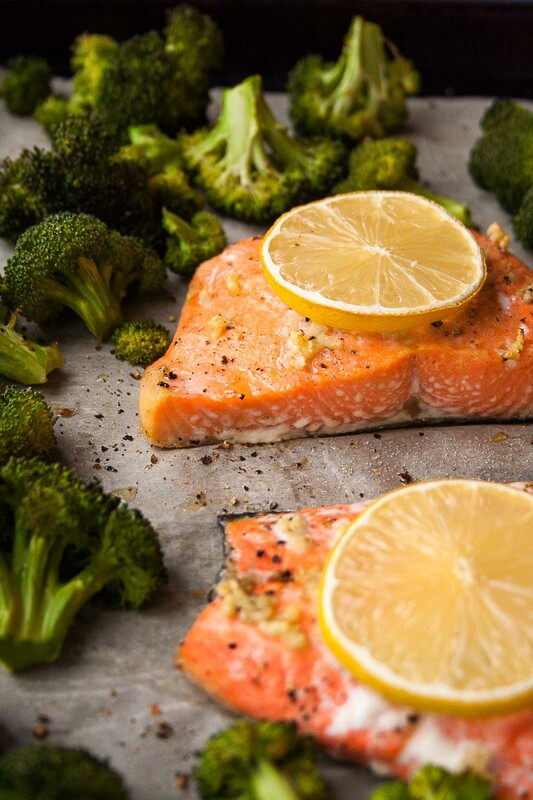 Now that you have your salmon, let’s make the easiest and tastiest meal EVA! Chop the broccoli into small pieces and place on the parchment. Drizzle with 2 Tablespoons olive oil and sprinkle with salt and pepper. Toss to coat. Move the broccoli to the edges of the pan and place salmon filets in the middle. Drizzle with remaining olive oil, salt and pepper. Add minced garlic and top each filet with a lemon slice. Bake until the salmon flakes. Timing will vary based on thickness; but for salmon that is about 1 inch thick, I bake it for 18 minutes. Your Family a Foodie Family? 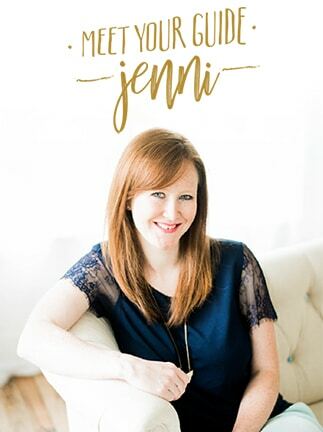 Jenni lives in Des Moines, Iowa with her amazing husband, two girls, two dogs who think they are children, and a feisty cat. She is the creator of The Gingered Whisk, a recipe blog dedicated to finding easy, healthy-ish, and tasty weeknight meals that kids and adults alike will love. She is super passionate about helping every member of a family learn to love great food. When not cooking, eating, or thinking about food, she is often hiking around area parks, creating intricate legos castles with her girls, watching nerdy tv with her husband, or curled up in a corner somewhere reading a good book. Yummy! I love how simple this is! My name is Jenni, and I'm an Iowa mama of three. 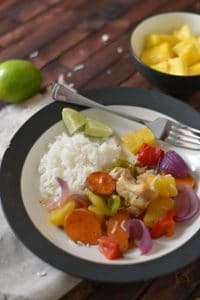 I am passionate about raising kids who are adventurous eaters through quick and healthy weeknight meals inspired by global cuisine! Forget bland "kid food" in cutesy shapes, this is the food you crave! Do You Want Ideas for Easy Weeknight Meals for Your Family? 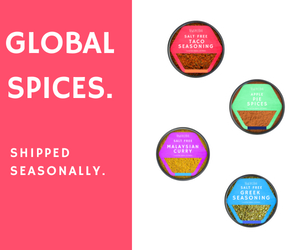 Cook global cuisine for busy weeknights your kids will actually eat. 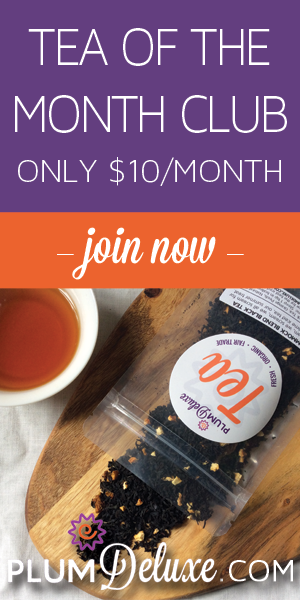 You are on your way to discovering awesome healthy, easy, & delicious meals your family will love!